This recipe is exactly like Huevos Rancheros, except for the fact that each egg has a different sauce. 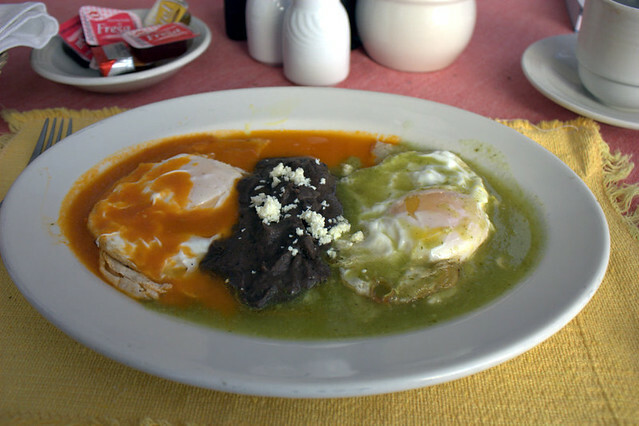 Ingredients: eggs (2), tortillas (2), red sauce and green sauce (to taste, about 3 table spoons minimum each), oil for frying, toppings to taste (avocado, refried beans, etc). Instructions: The tortillas need to be fried first. To do this, pour a bit of oil into a frying pan, add the tortilla (one at the time) when the oil becomes hot. Fry until crispy, about a minute for each tortilla. Remove tortillas from pan and set aside. Prepare the eggs as you normally would if you were making fried eggs. When cooked, place on top of the tortilla. Divide the eggs with a barrier of refried beans. Top with red sauce on one side, green on the other and add toppings and salt to taste.